In 1968, a group of those who had celebrated their teen years in the soda fountains of Lebanon, Ohio became concerned with the condition of some of the buildings downtown like the dilapidated structure on Mulberry Street that was for sale. The group got together and formed Downtown Lebanon Inc. Each tossed in $1,000, purchased the building, and leveled it for a parking lot. Next, the King's Grill on Broadway went on the market. To raise the money needed to purchase it, Downtown Lebanon Inc. changed it's name to Greater Lebanon Inc. to include more businesses, and then sold shares. 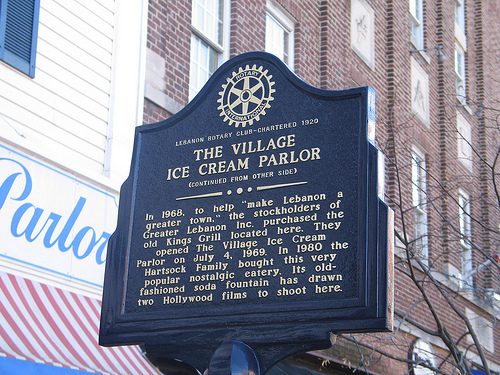 With a dream to create an old fashioned soda fountain, and in keeping with the historic flavor of downtown Lebanon Ohio, Greater Lebanon Inc. celebrated the opening of The Village Ice Cream Parlor on July 4, 1969. In 1980, Dave & Phyllis Hartsock purchased the business. It soon became a family operation including children Susan Alexander, Sandy Fuston and Mike Hartsock. In December of 2014, the Zwelling family of Lebanon purchased the business and property. Committed to the historic preservation and its relationship to the community, the Zwelling's look forward to continuing the parlor's legacy as it turns another page in it's storied history. On any given day, you'll find a fun and relaxing crowd of tourists, shoppers, locals and even celebrities at The Village Ice Cream Parlor. From Ohio governors to movie stars, it's the place for fun and flavor in southwestern Ohio!